The SCGA Public Links Championship is formerly the PLGA Amateur Championship, which started in 1968. This Championship is open to amateurs who are members of the SCGA and belong to a public or affiliate golf club with a current Handicap Index of 5.4 or below at the time of registration. Players who are listed on a private or semi-private club’s roster must also be listed on a public or affiliate roster to be eligible. The Championship is conducted over 36 holes of individual stroke play. 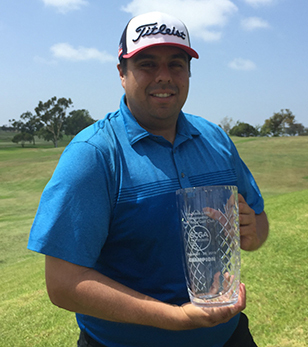 Coming out of the gates with a blistering 8-under 64, Brandon Gama took any suspense out of the equation for the 51st SCGA Public Links Championship at River Ridge GC in Oxnard. The Santa Barbara native felt right at home at River Ridge GC, backing up his opening round 64 with a 3-under 69 to give himself a 7-stroke lead heading into the final day of play. His final round 73 was more than enough to hang on for his first-ever SCGA title at 10-under par. Gama’s impressive opening-round 64 included eight birdies and not a single blemish on the scorecard. He rolled in four birdies on the front nine and another four birdies on the back nine, ensuring himself a four-shot cushion heading into day two. During the second round, it was more of the same for the La Purisima GC member. Tossing in six birdies and three bogeys, Gama stretched his lead to seven and put himself in a position to coast to victory on the championship’s final day. Tongun Lako Losarah (Mountain Meadows GC) finished in second place at 5-under after firing 70-70-71. Timothy Snyder (Tierra Rejada GC) rounded out the podium finishing third with a final tally of 3-under.